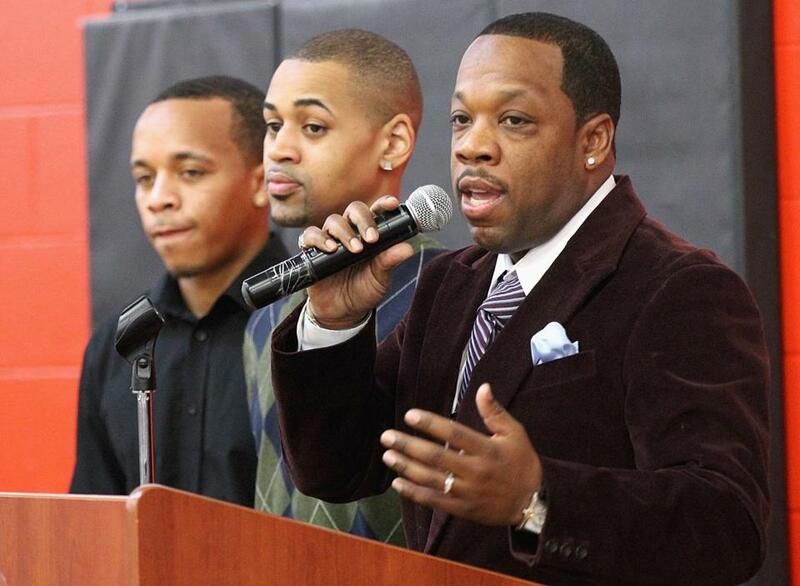 Michael Bivins (right) spoke at the sixth annual Martin Luther King breakfast at the Roxbury YMCA in 2014. Michael Bivins, part of the band New Edition and the Biv in Bell Biv Devoe, returned to his home neighborhood of Roxbury Thursday to have a basketball court dedicated to him. Though Bivins’s claim to fame came through music, basketball has been a passion of his since he was young. “New Edition was my ticket out of Orchard Park, but ‘ball was my first love,” Bivins said Thursday, referring to the Boston Housing Authority housing development where he grew up. Though Bivins became a household name nation-wide, his love for Roxbury never died. Walsh said Bivins grew up playing on basketball courts around the city, but especially at Ramsay Park on Washington Street where he has hosted an annual basketball tournament. Bivins said Thursday he was pleased to be back in his Roxbury neighborhood. “I never thought I would have left the ‘hood singing ‘Candy Girl’ and would have came back to the ‘hood with a basketball court,” Bivins said.